I like a good time displacement story in which, for whatever reason, the main character somehow becomes "unstuck in time", either figuratively (MEMENTO) or literally (Kurt Vonnegut's SLAUGHTERHOUSE FIVE). Or, as in both TIMECRIMES and David Gerrold's fascinating novel "The Man Who Folded Himself", creates different versions of himself with each time jump which then interact in unexpected ways. 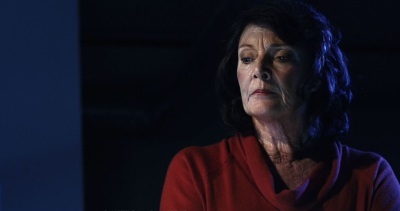 With the aptly-titled DISPLACEMENT (2016), writer-director Kenneth Mader (CARNIVORE) has come up with a humdinger of a time displacement yarn that begins when physics whiz Cassie Sinclair (Courtney Hope, "The Bold & the Beautiful", ALLEGIANT) wakes up in an ice bath, with boyfriend Brian (Christopher Backus) lying dead on the bed with a fatal gunshot wound. Then, after a weird flash of light, the sun has changed position in the sky and her dead boyfriend, Brian (Christopher Backus), isn't dead anymore. And that's just the start. It turns out that Cassie's college master's thesis on time travel has been "borrowed" by the usual secret government agency in order to be militarized, and she's been swept up in the whole thing as sort of a guinea pig. But something's gone seriously wrong with the experiment, something which threatens the stability of the entire universe, and it's up to Cassie to locate and correct the fault before it's too late for her and everyone else. This is one of those mentally-stimulating "hard sci-fi" yarns that's brimming with technobabble that only an ardent science enthusiast could make total sense of, yet somehow I didn't have to follow every little nitpicky detail in order to keep up with it. The general idea of the whole thing is well conveyed and we easily get caught up in Cassie's various intellectual conundrums, while the action and suspense angles are well covered by the organization's attempts to capture and "process" her. We're also kept guessing as to just who she can and can't trust. Brian becomes a suspect when she discovers her stolen notes in his backpack; her friend Josh (Karan Oberoi) to whom she turns for help seemingly betrays her; and even her own estranged father (Lou Richards) is in possession of her original notebooks and seems to be helping the bad guys develop her theory into a working time travel device. Complicating things for her emotionally is the fact that her mother, Carol (Susan Blakely, THE CONCORDE: AIRPORT '79), has recently died of cancer, which triggers Cassie's desire to successfully complete the experiment and somehow help her despite the danger. This part of the story gives it an emotional core that resonates amidst all the cold science and Hitchcock-like intrigue, making it one of the most all-around enjoyable sci-fi flicks I've settled into in a while. Mader's film is well-crafted and immediately displays eye-pleasing art design and photography that contribute much to the overall experience. 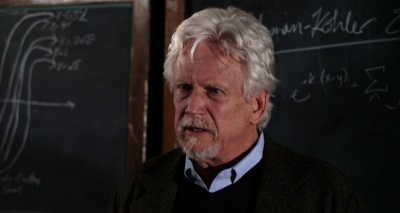 Add to that some fine performanes from an outstanding cast (Courtney Hope is particularly good as Cassie) including Susan Blakely, Bruce Davison (WILLARD, X-MEN) as the enigmatic Professor Becker, and SUPERMAN II's Sarah Douglas as a shadowy government operative intent on gaining Cassie's cooperation by any means necessary. If the recent TIMECRIMES wasn't enough to totally blow your mind when it comes to time travel thrillers, or you just want more of that wonderfully weird vibe that only comes from a good old-fashioned time displacement tale, the scintillating DISPLACEMENT is well worth devoting some of your time to. 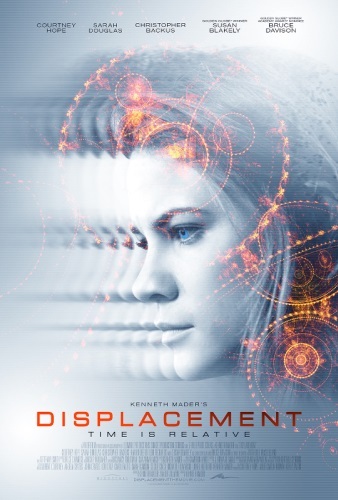 Arcadia Releasing Group will release writer/director Kenneth Mader’s award-winning sci-fi thriller DISPLACEMENT for an exclusive LA theatrical run at Laemmle’s Monica Film Center as well as on VOD April 28th, followed by play dates in Chicago and Dallas. VOD platforms include: Amazon Prime, iTunes, and Google Play, and the DVD will be available for rental from Family Video in May. Further DVD/BD release to follow.